Ready to rock and roll? 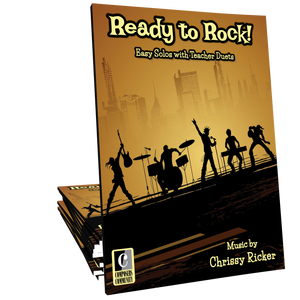 This collection will delight early intermediates who are itching to play cool rock and pop-style tunes from a variety of genres. 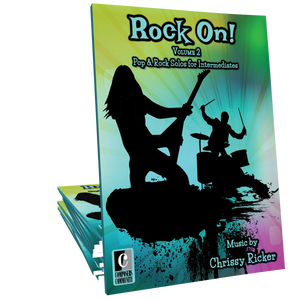 These ten showcase solos, composed by Chrissy Ricker, will please even the pickiest of students and will be a hit at your next recital! I had an older beginner who told me he liked rock music, so as soon as he was able to play from this book, I showed him the pieces. He has already played two of them and wants to start on a third. It's a great collection! What a fun book for kids!!! I bought this for myself and loved every single song, so I'm ordering another for a student of mine that I know she is going to love! Song books are so different from when I was a child taking lessons. Would have loved to have cool songs like this! This book has been such a success with one of my students who finished Movement 1 and wasn’t quite ready to move on to Movement 2. The pieces are fun and unique and have great titles. She is moving through the book rapidly and getting so much more confidence with her note reading. I can't wait to share this with my students! So much emotion can be expressed in your music! Terrific collection for the tweens and the teens! And I'm going to enjoy playing through these too! Love this collection! Looking forward to using this with my students! An instant hit for the picky tween audience! Great selections, well-written and so appealing! Thank you for this book! It has really piqued the enthusiasm of one of my 7th grade students who was losing interest in piano this year. She is a shy young teen but she loved playing at her school talent shows in the past. I've mostly found a common bond with her in lyrical music or well known classical pieces but this year she just checked out. 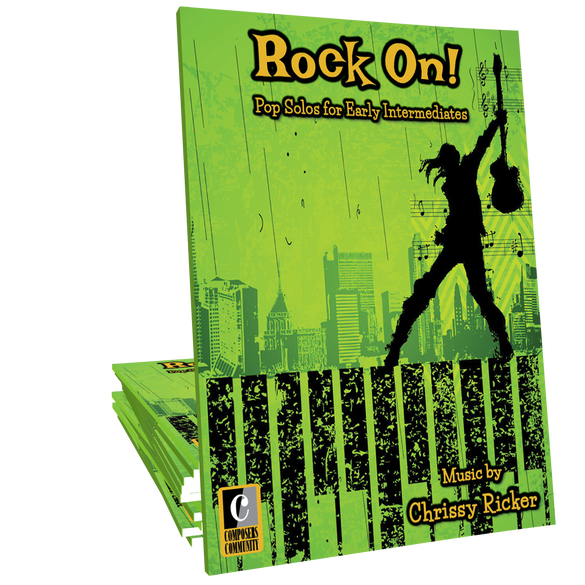 In comes Chrissy Ricker's Rock On! book to save the day!! She's learned most of the book and is back to playing at school again! Her parents and this piano teacher are thrilled! Thank you!! I'm going to have to buy more of these books because my students will eat this up! Exciting music with catchy, energetic rhythms. Bored student-saver! 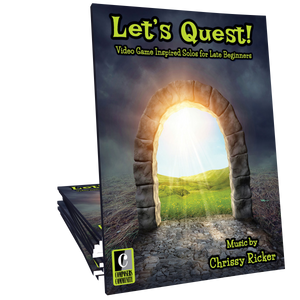 Accessible to late beginners with easy key signatures and familiar chords that fit under small hands. Pieces are 2-3 pages, short enough to be learned quickly. I am in love with this book! These songs are refreshing, fun, and easy on the hands. Simple patterns are easy to pick out but make the song sound much harder and impressive. My tweens/teens love these! Chrissy does no wrong. My studio is obsessed with her pieces. Be it Christmas or Spring, her name is always listed several times on the program. This collection puts the A in AWESOME. Not only are the pieces appealing to the budding pianists' ears, but to audiences of all as well. I LOVE this compilation!! Great job really capturing the rock feel and making it accessible! I can hardly wait to share this book with a particular boy in my studio. He is going to feel like a rock star when he plays these songs! My student loves the piece "Sweet" in this book because of the neat 16th note rhythms. She also loves the very cool sound of measures 23 - 30. It is a great piece to teach, and also a fun piece to learn! I bought this to play through and see if these songs would be a great fit for my studio. Turns out I love the whole book!! There is a great variety of cool pieces in here- a little something for everybody. 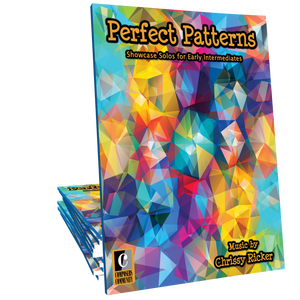 FABULOUS COLLECTION for early intermediates! Chrissy Ricker has tapped into the sounds young people want to play and has made them accessible to progressing pianists. I have the studio license and placed five students in it the first week. They're in love with this music! The studio license is on my wishlist! These are great and I have a few students in mind who will GOBBLE them up!